After much anticipation (and procrastination), I proudly present to you the OWAZ music video for “White & Nerdy”! 😀 Expect a blooper reel soon, too! 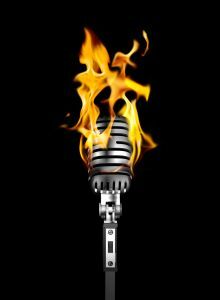 Blow up the mic without blowing up your bank account! It’s been proven by leading scientists that people love free things. Free samples, free parking, free range, free Tibet… the list can go on and on. However, in this day and age, people love nothing more than free music. Regardless of your language, music speaks to everyone, and the best thing it can say is “Hey! You can listen to me without having to worry about being sent to the slammer and taking a fleshy immunization from a guy twice your size!” With that, I give you the first of many installments of The Free Music Roundup! The following sources will lead you to some sweet tunes without having to jump through hoops or become anyone’s MySpace friend. (Besides, MySpace has already picked out a nice plot between Lycos and Geocities in the Internet graveyard.) In this edition of free music roundup, we’ll snag some remixes from mc chris, NIN frontman Trent Reznor’s side project, and what may be the lost city of gold for 8-bit connoisseurs. Two days ago, the polkaing parody patriarch known as “Weird Al” Yankovic visited Summerfest for a fantastic two-hour show. Accompanied by various Robot Chicken-esque video sequences in between songs, the show was a constant barrage of laughs. Weird actions speak louder than weird words, so I’m going to leave you with two videos I shot myself with surprisingly good audio and video quality: The opening song and the closing song.